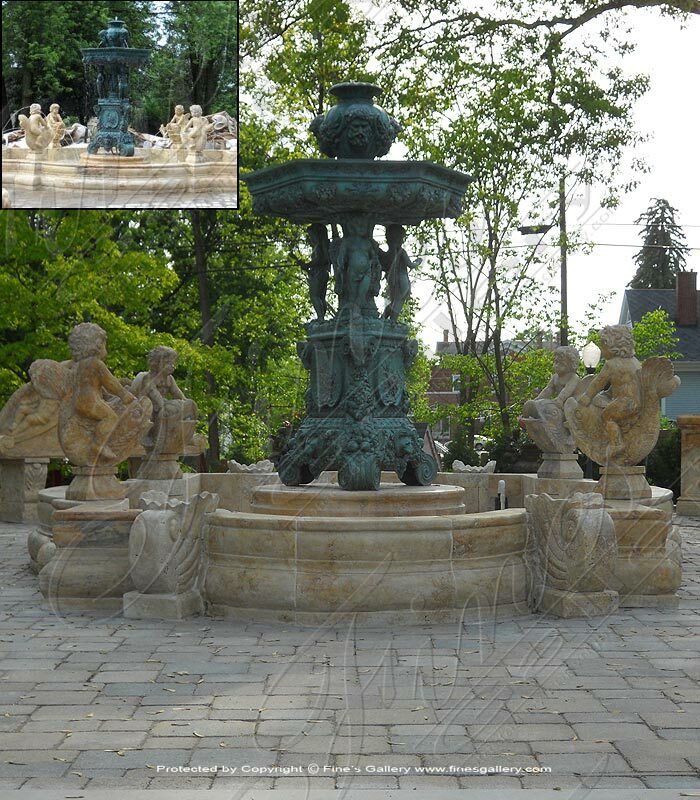 A traditional tiered granite fountain in earth toned color. Available for a limited time only. Dimensions: H: 97" W: 120" D: 120" View Colors Call Us! 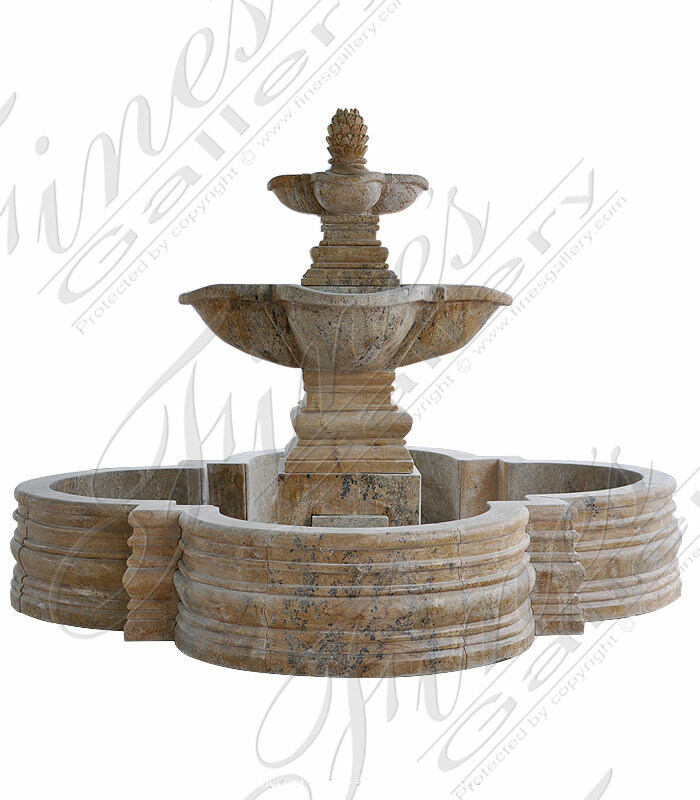 Transitional Tuscan Cream Marble Garden Fountain Feature. 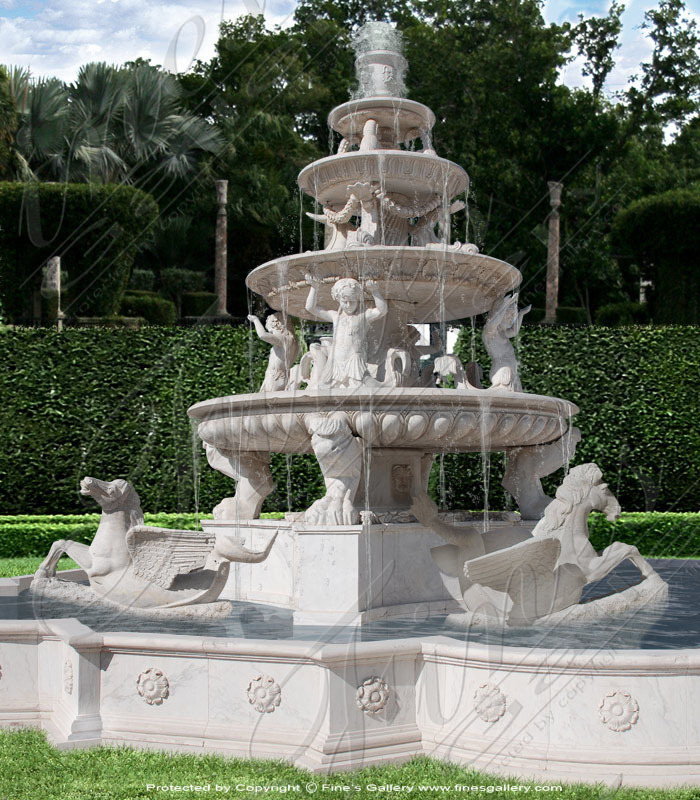 This beautifully designed marble fountain is created in a cream colored marble. 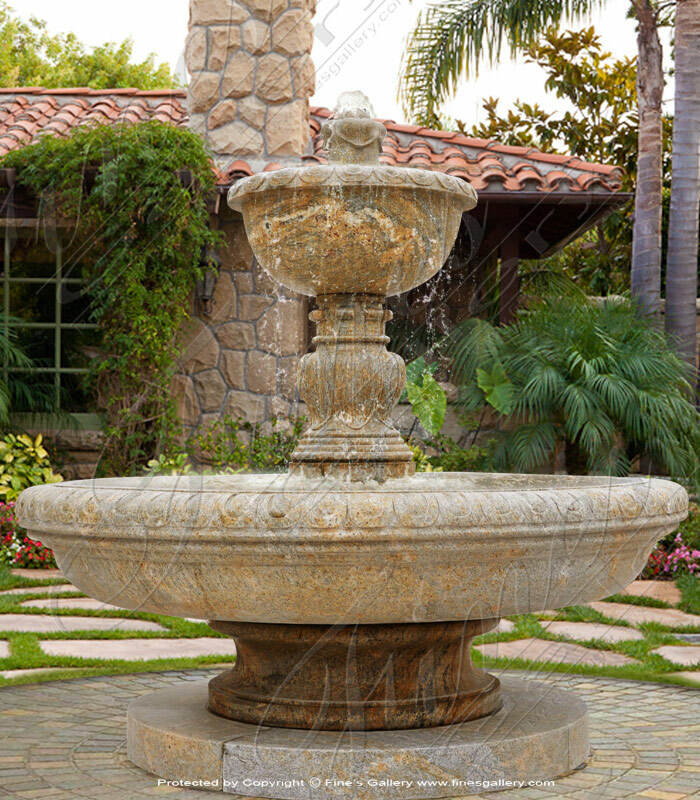 This Fountain and pool would be great for an entrance way or a garden area. 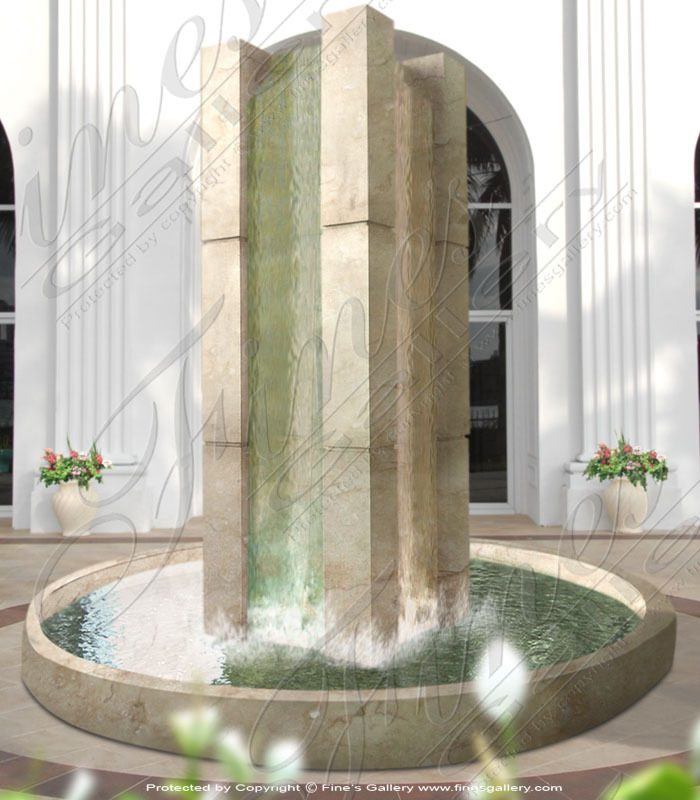 Dimensions: H: 42" W: 96" D: 96" View Colors Call Us! 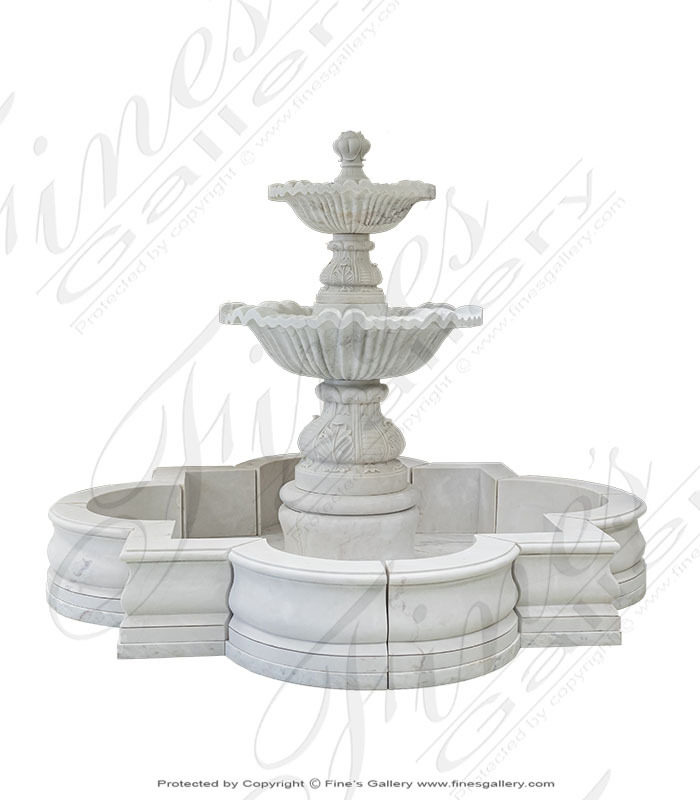 Elegant Courtyards White Marble Fountain features scalloped edges on each of the three tiers. 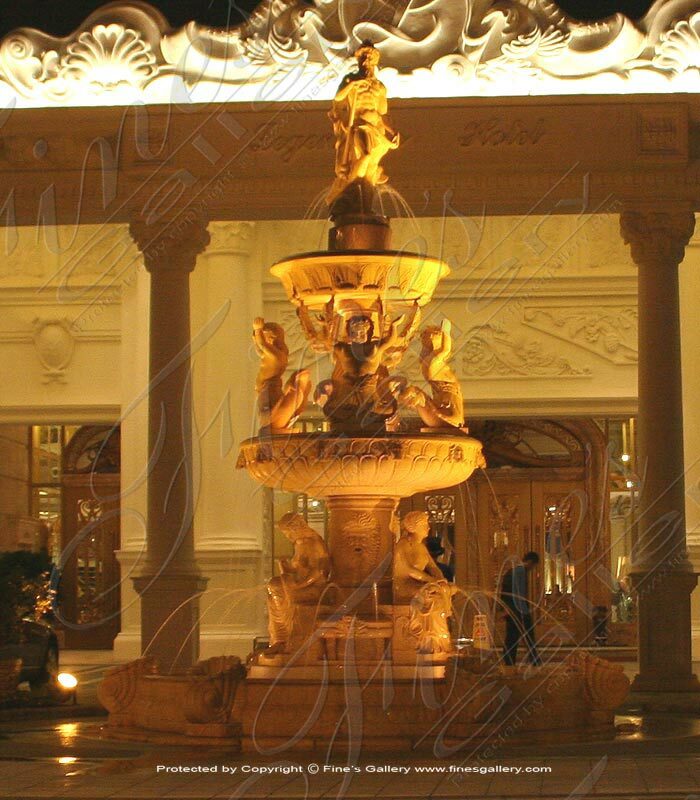 Hand carved from luxurious white marble. White marble is beautiful, durable and fits well into any traditional, transitional or contemporary home style. Dimensions: H: 106" W: 120" D: 120" View Colors Call Us! 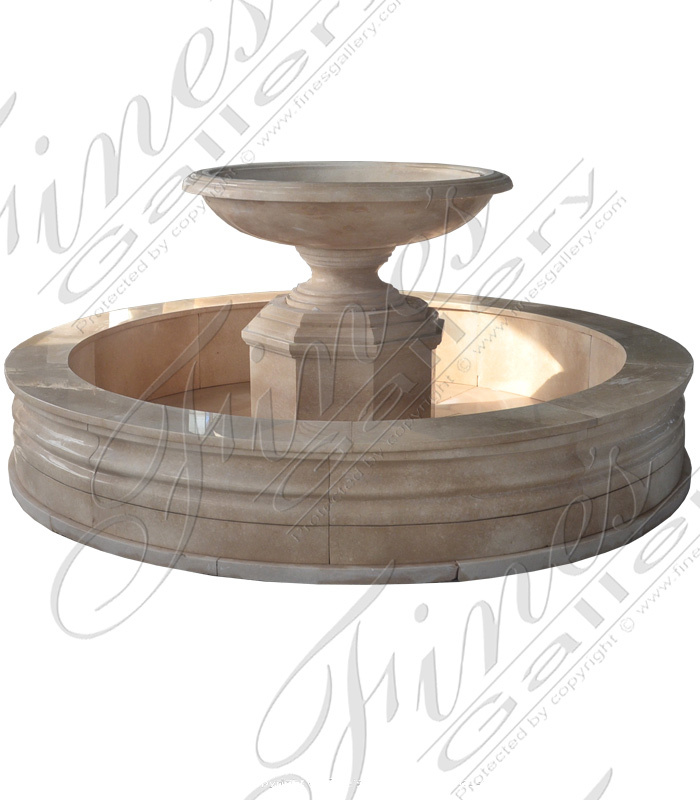 Beige Marble Three Tiered Fountain. 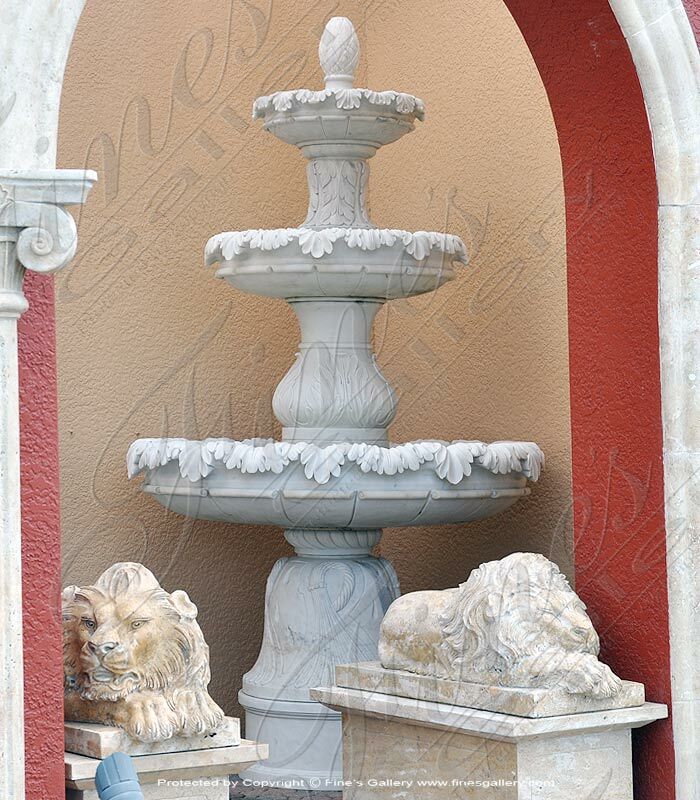 This fountain features scalloped edge detail on each of the three tiers. 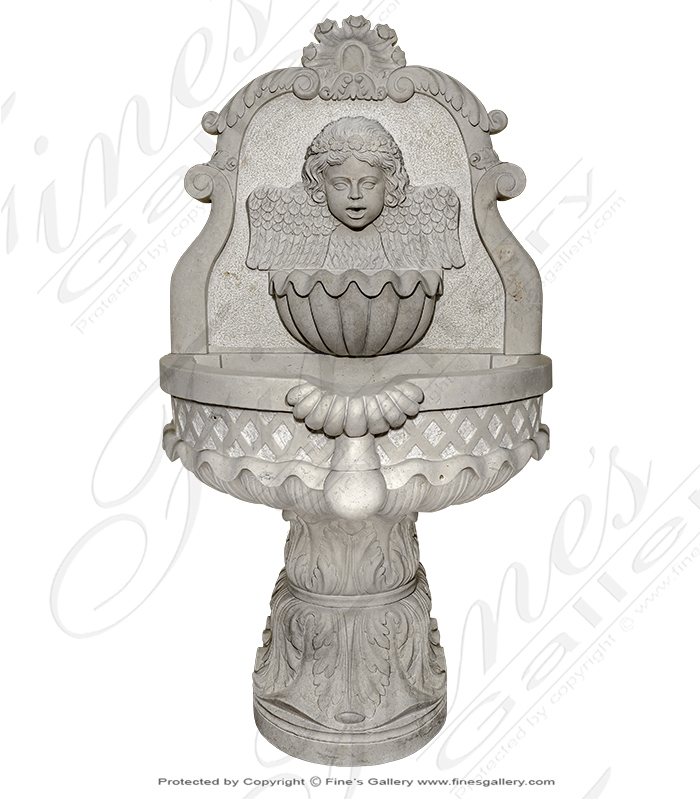 Experience the beauty and durability of natural marble fountain features with Fines Gallerys masterfully carved marble products. Dimensions: H: 72" W: 101" D: 101" View Colors Call Us! 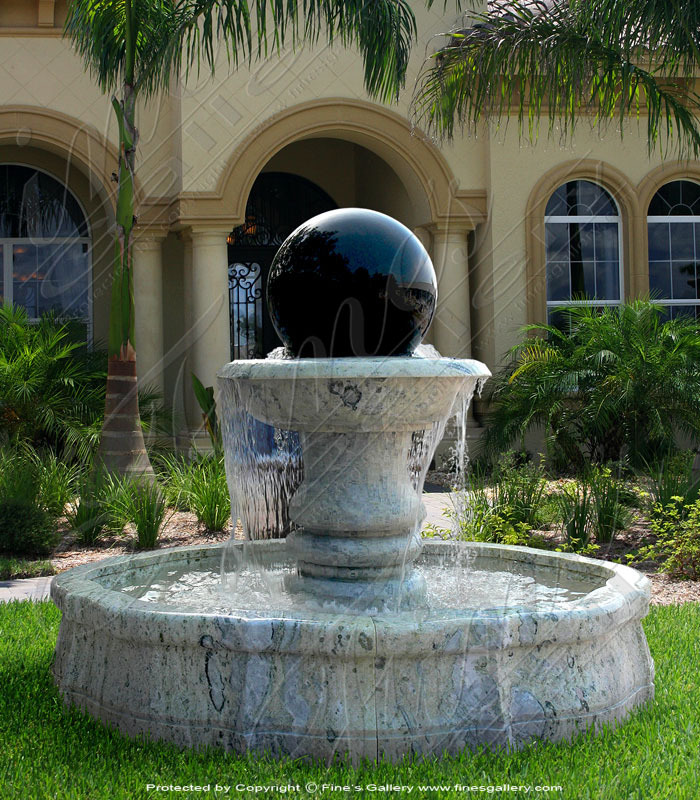 The simple, clean and very elegant transitional granite fountain is available here at Fines Gallery of Bonita Springs Florida. Hours of pain staking design time make for a refined result. Accept no imitation. 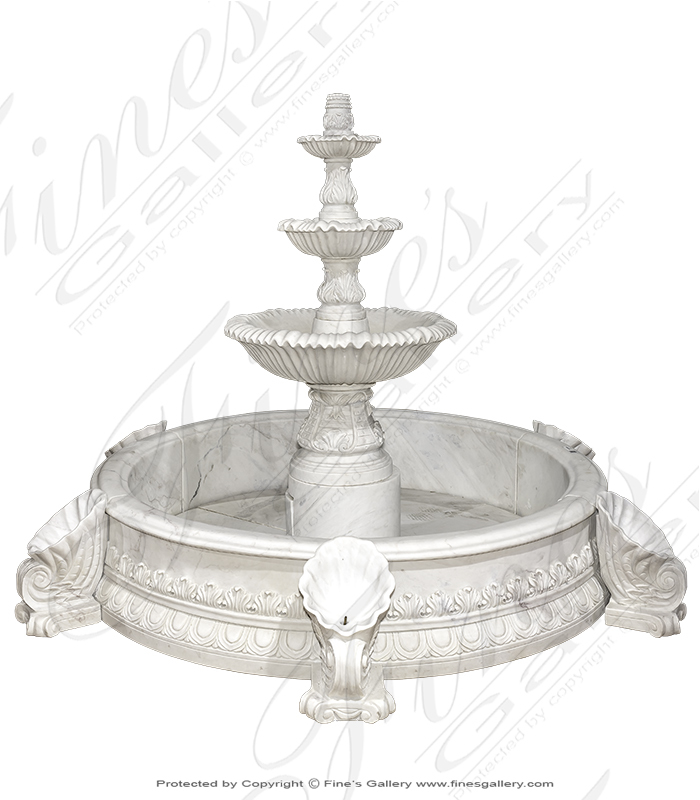 Includes stainless steel water ring. 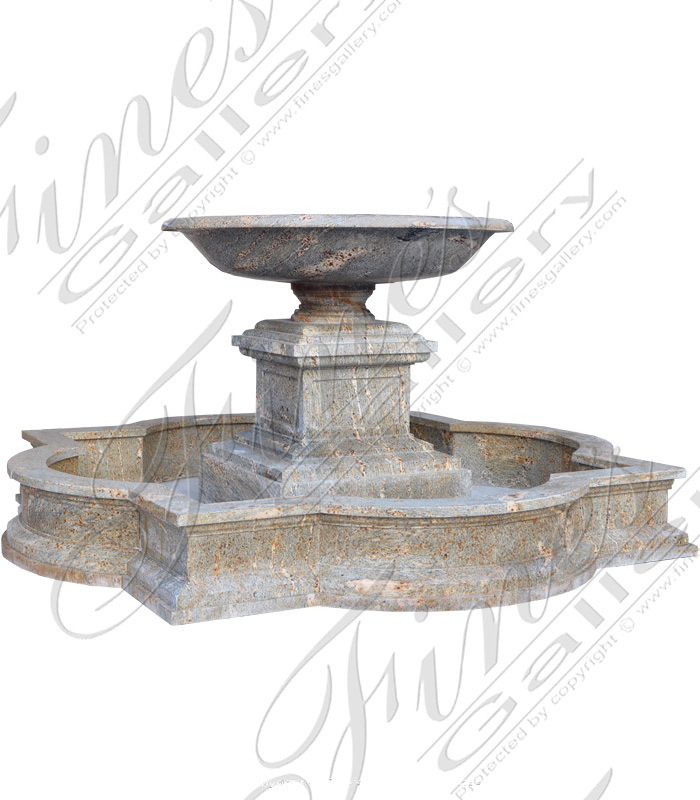 Two Tier Granite Fountain in earth toned granite. Twelve feet in diameter. 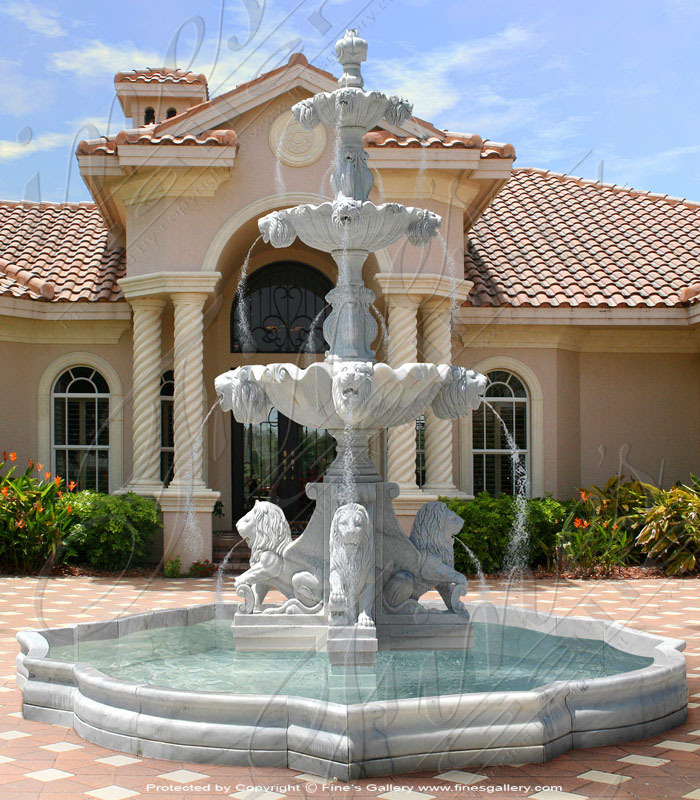 Popular in french country, mediterranean, italian villa style homes. 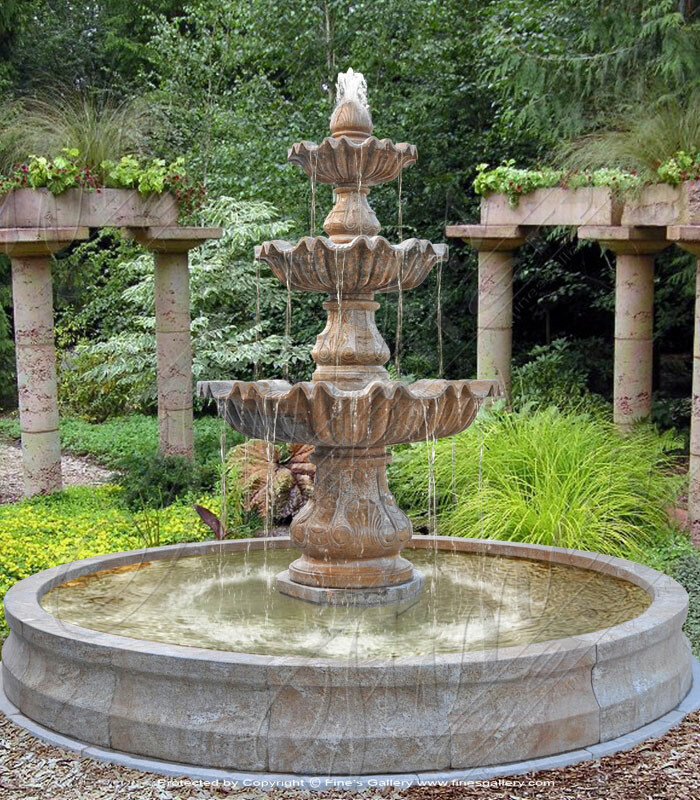 Granite fountains have been known to last for a lifetime. 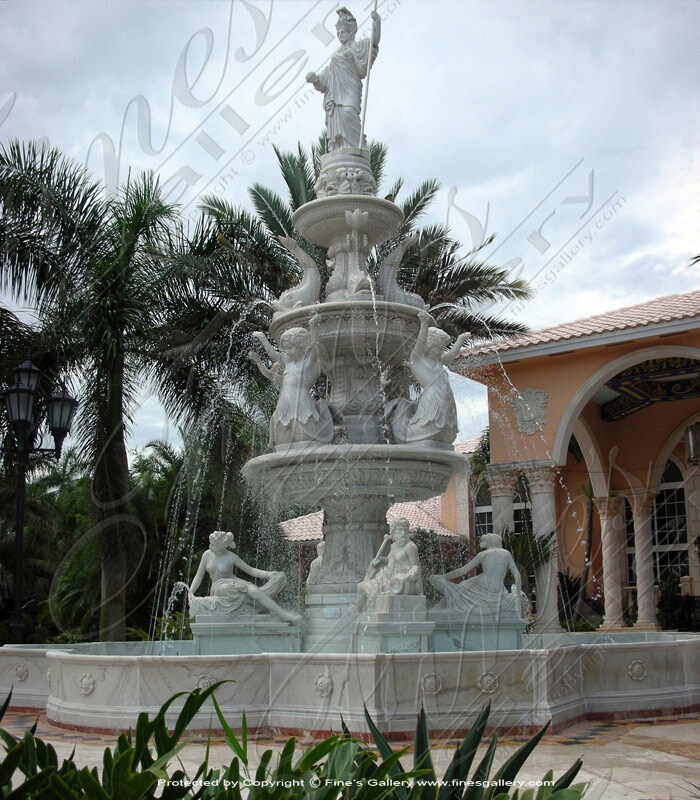 Bonita Springs Showroom Granite Fountain! Dimensions: H: 90" W: 144" D: 144" View Colors Call Us! Simply gorgeous! 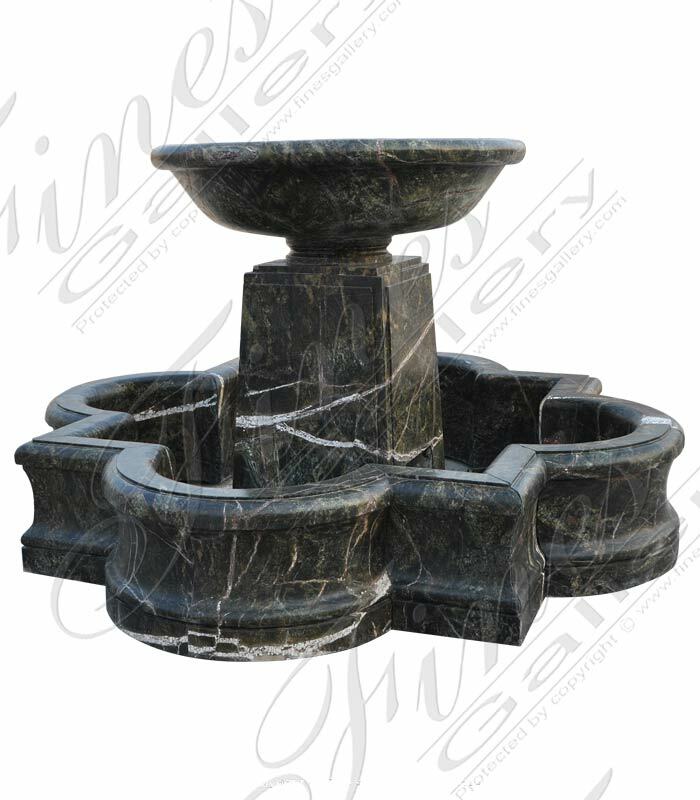 A perfect triple tiered design featuring fine craftsmanship, elegant hand carved artistry, and the beauty of fine Rosetta marble. 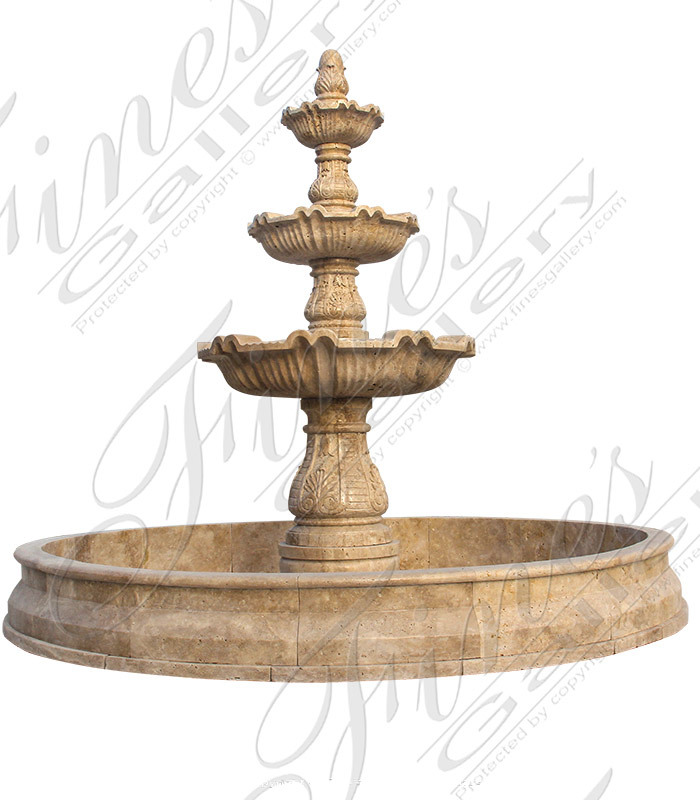 Create an environment of luxury at your estate with this sophisticated fountain. Dimensions: H: 100" W: 140" D: 140" View Colors Call Us! 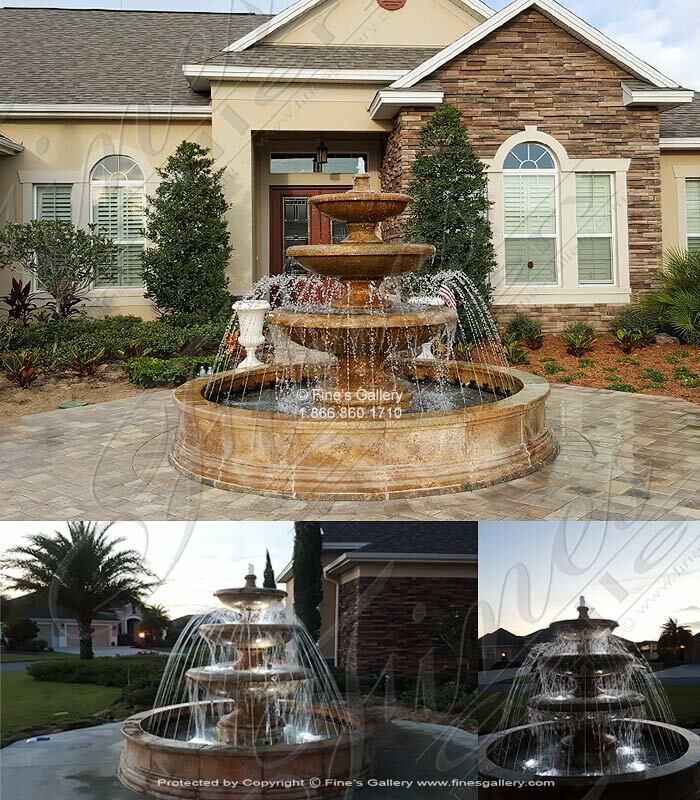 Waterfalls fill and overflow this luxurious double tiered Verona Gardens Granite Fountain for a dazzling scene that is pure elegance. 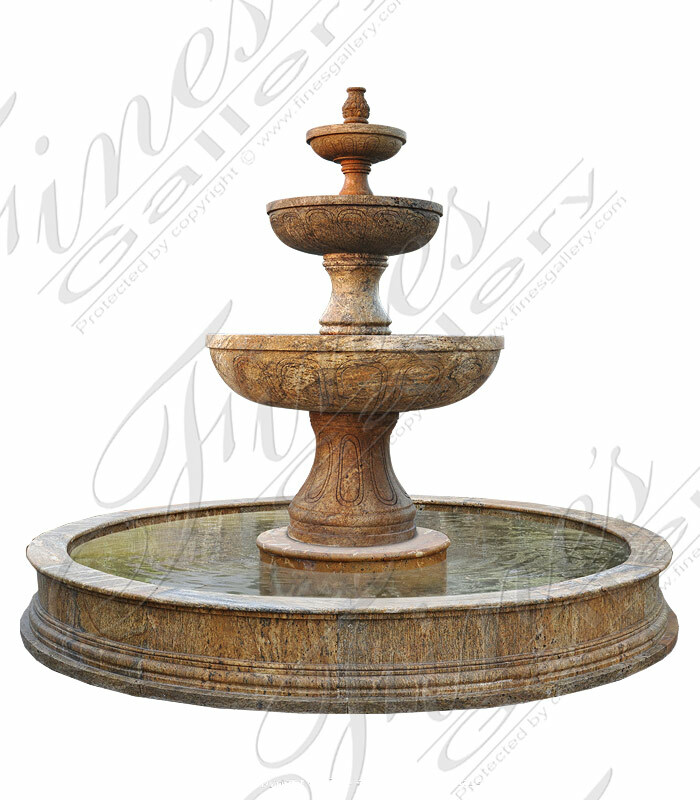 Sculpted from beautiful Antique Gold Granite, this fountain is the perfect finishing touch for a majestic yard. Dimensions: H: 86" W: 120" D: 120" View Colors Call Us! 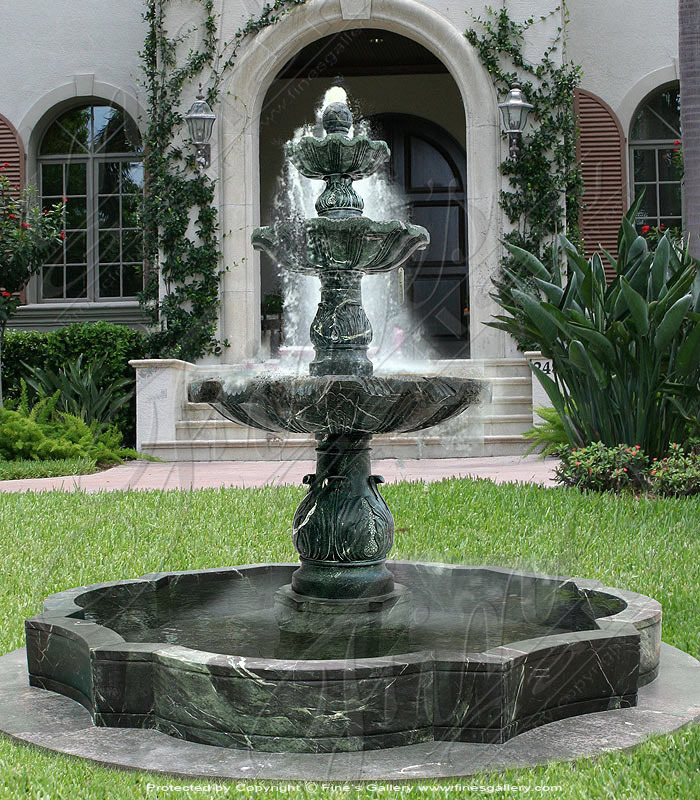 This beautiful rainforest green marble fountain is available exclusively through Fine's Gallery. Contact the gallery today for more information. 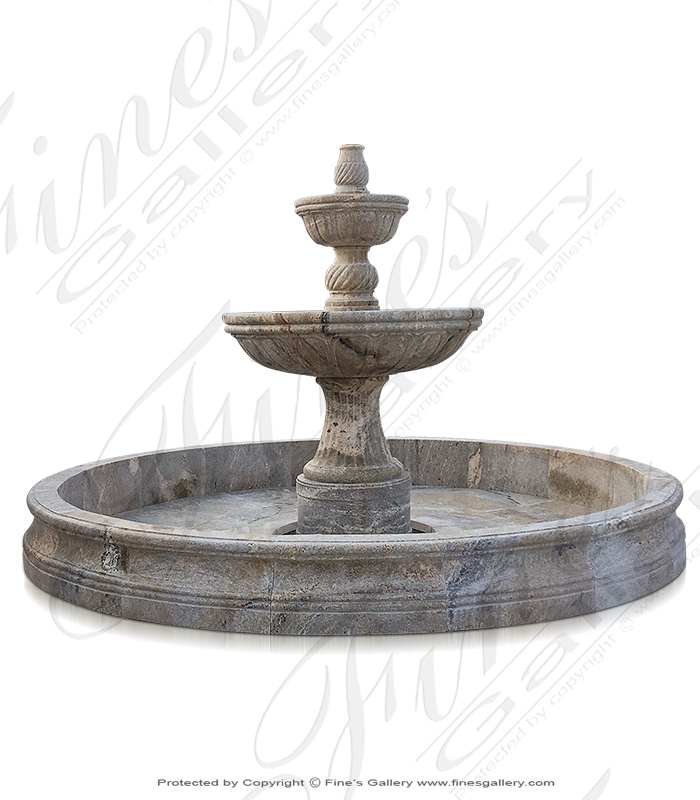 Dimensions: H: 56.5" W: 95" D: 95" View Colors Call Us! Dimensions: H: 100" W: 120" D: 120" View Colors Call Us! 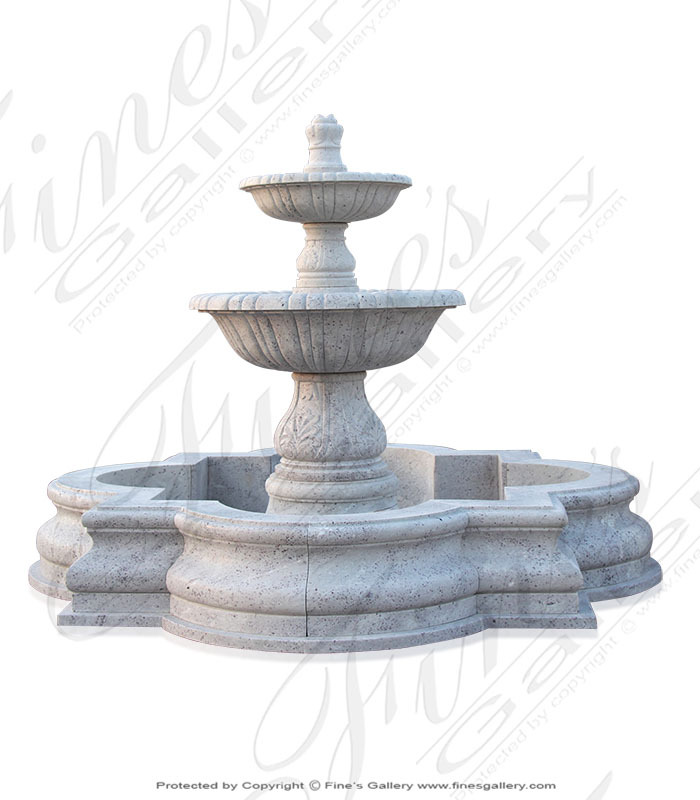 Exotic White Granite Fountain is stunning. 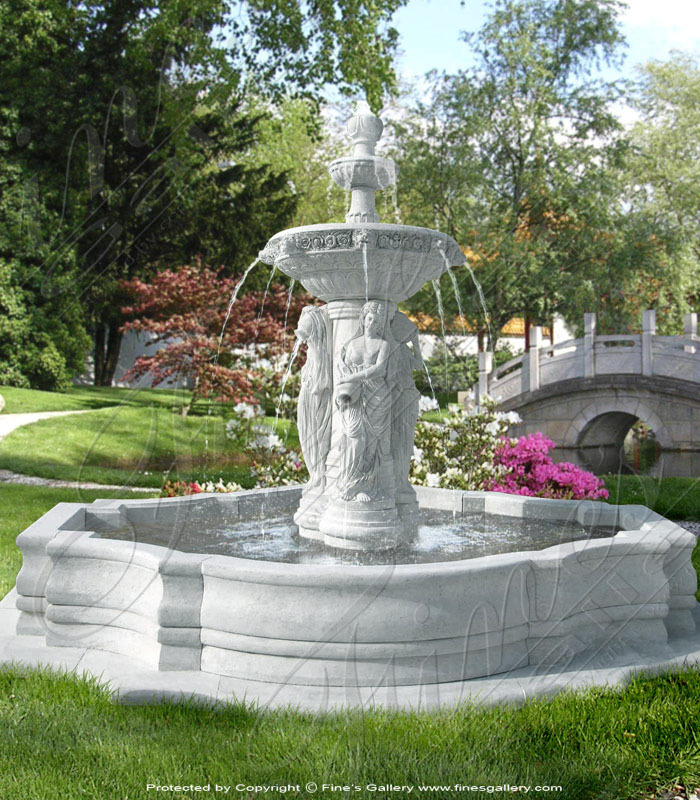 A rare imported premium white granite import available for a limited time only! Add to your circular driveway motorcourt or garden area. 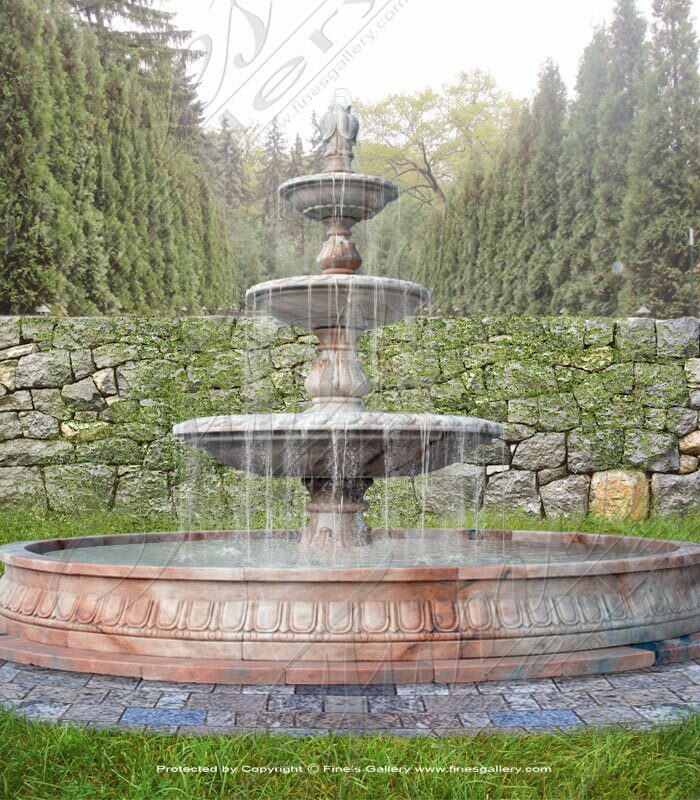 Natural beautiful durable granite is stunning and low maintenance! Dimensions: H: 70" W: 96" D: 96" View Colors Call Us! 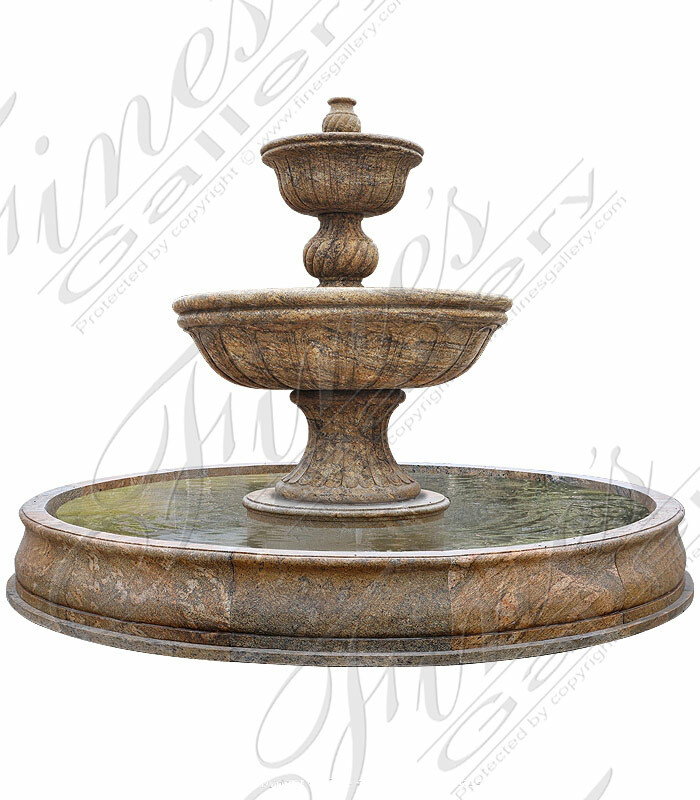 A traditional style two tiered earth toned granite fountain. Dimensions: H: 87" W: 120" D: 120" View Colors Call Us! 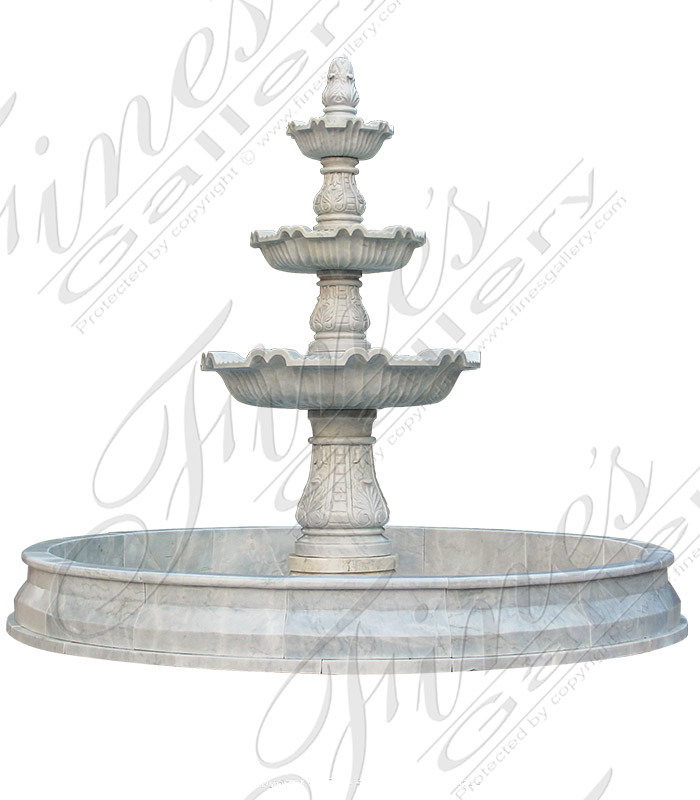 Dimensions: H: 59" W: 123" D: 123" View Colors Call Us!